fans. Our special correspondent Karthik - Cincinnati came all the way to chicago for Premier show on April 13th ( 10 hrs drive). Premier show(Chicago) photo was published in Daily Thanthi on 15th( Chennai edition) and 17th on Trichy Edition. Chicago crowd photo will be published in Sundays JV." Shyam (Detroit) - "We were all students and in Detroit when we enjoyed BABA. Now We all graduated and work in different cities. We planned to get together for thalaivar movie in Detroit.Thalaivar brought us together. We took a day off & I came from Washington DC, 6 guys from Chicago, 2 from Texas, 1 from Arizona... all to celebrate Thalaivar padam (what else could be a better festival for us).We along with other friends in Detroi went to the movie,Not to see people clapping and dancing but to do 'em.We went in a packed van with Rajini fotos....We parked the van by the theatre entrance with full volume Rajini songs. We were all wearing rajini t-Shirts.Everybody came to us and said 'kalakkal t-shirt, kalakkal van'. Inside theatre started rahalai. First scene Rajini apears and 10 of us with karpooram went screaming to the scene and .... (u know rest) Appura we brought 4 bags of shreaded paper...emptied everything in one sight of Thalaivar. 2+ year appuram Rajiniye paarthu senti ayittoam. Danced for 2 songs. Then came our Thalaivar in a different get-up laka laka laka.Pull arichu pochu...We came back again the next morning ...had the same fun....It was great fun to watch Rajini movie with dearest friends.It has always been fun to watch Rajini Movie...But this time it was more then fun...One of the most memorable moments in our life....... Thalaivar Forever (words in our T-shirt)...laka laka laka laka..."
Sriram (New Jersey) - "Watching CM in NJ was a great experience. Obviously the hall was filled to the brim with software professionals. It was a big complex and there were a few movies screened including the Hindi version of ME. When we entered, the owner requested to behave and not do any gallata. I thought he was rude when he said that. The crowd was so much that they screened CM simultaneously in a different theatre too for the same show. Everybody in theatre had come to see CM only. There were big crowd for the 10.30 show too. As soon as SUPERSTAR name came on screen, hell broke loose. There were Jigna papers flying and I could smell fire. Ten guys had a coconut with camphor and went to the dias and started doing Arthi. This really shocking because I did not expect this in NJ from the so called educated guys. So many guys were shouting Thaliva Thaliva in the theatre. I was under the influence of seeing thalaivar is screen. It is so nice to see him and I was like a teenager blushing all the time. My wife could not understand me and said she found it hard to believe that I am 36 yr old guy with a kid. 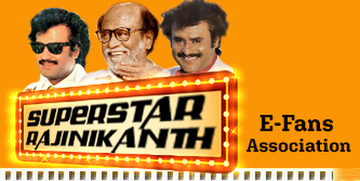 I introduced my 3 year old daughter to the fun world of Rajini and she was impressed with what she saw." Subaash (San Jose) - "Daily they are having around 8 shows due to the overwhelming response they are getting from the public... usually for tamil movies screened here it will be more like a special preview show as not more than 25-50 people will be there for any show. For CM the scene was entirely different.. even in the online booking we weren't getting tickets easily.., finally we got tickets for Apr 16th, 10.30 pm show.. and there were people waiting for the next show at that time itself with their reservation receipts..
Till yesterday night 12.30 show all shows are 100% booked. Infact for the first time we saw the theatre guys adding extra chairs for people who didn't have reservation but somehow wanted to watch the movie.. The public includes tamilians & telugu, Kannadiga, Mallu and north indians.. for no other tamil films you will see response from all quarters... of course one exception is for Kamal moview there will be a good number of mallus here..."
Darien Rukshan (New York) - "The movie was simply fantastic! I mean, here I was sitting in the heart of New York City watching Chandramukhi and it was as if I was transplanted to some theatre in Tamil Nadu because the audience was totally out of this world...the spontaneous clapping, the shouts of joy, the whistles of passion...it was all truly overwhelming. The entrance scene of Rajini was just way too cool; the crowd just let loose once they knew whose foot : ) was on the screen!" Sunder - "I went to the Saturday noon show � The fans were requested not to do anything with camphor. But in spite of all these pre-warnings, the movie has to be halted twice [first time when the letter S,U,P,E,R came and second time when Rajini came on screen for the first time] with the theatre owner objecting papers thrown all over. But after the second halt, distributor requested the fans not to throw any more paper. But the noise [thalaivaa] and Visil sounds could not be controlled by anyone. Even I saw women coming out with visil sound. This is really Gods gift. No wonder Japanese love him too. Kurinji flowers once in 12 years and we get to enjoy all these once in 3 years. 2 days have passed after the movie for some of the children in the area, but they `re still shouting "Lakalakalakala". Such is the impact of the movie. In Washington D.C �The distributor ended up putting extra shows on Sunday to accommodate the over enthusiastic crowd who couldn't get tickets on Friday, Saturday shows. People drove hundreds of miles from all over to watch the movie. Overall result - General audience love the movie and women in particular like it a lot. Movie is definitely 100% a super duper hit of the decade." Sunil (West Virginia) - West Virginia University (WVU) Rajini fans association, Morgantown, WV. The Rajini fans from our university could not wait for the movie to release. We stuck posters of Chandramukhi all over the university a week before the movie was scheduled to release! Most of the students here,(including Americans) were astonished by our craze for 'Thalai'!Initially we planned to go to Pittsburgh or Cleveland to see the movie(since both are relatively nearer to our place). But since the movie was gonna be released late in both places, we planned to go to New Jersey to see it right on the first day! 18 ppl started from our place to begin a 7 hour journey to see Thalai's new movie. We started with a small rally around our university town playing �Chandramukhi� songs with our cars being decorated with Chandramuhi posters! The next day we reached New Jersey. We started clapping and whistling when the gates for our movie were opened. We also chanted some punch dialogues like �LIC heightu...Superstaru weightu! ". The joy and enthusiasm among our gang to watch the movie was really great! Once the movie began.....it was fun and frolic right through! We were really sorry for the other ppl in the theatre, but Thalai's movie is like a festival for our guys! We danced, whistled, clapped, shouted and what not! We had the time of our lives!! We left the theatre with really satisfied hearts seeing 'Thalai's" new hit movie! We enjoyed by dancing to the songs outside the theatre again! It was truly a memorable day in our lives! None of us will forget this long trip to see our beloved thalai! We eagerly await his next movie!